New Delhi: Government is committed to sustaining growth of the country’s telecoms sector, Prime Minister Manmohan Singh said on Wednesday, seeking to boost investor confidence in the once-booming sector that has been hit by regulatory uncertainties. “I am aware of some concerns of the telecom industry regarding government policies in the telecom sector," Singh told a gathering of telecoms industry executives on Wednesday. India’s telecoms market, the second-largest in the world after China, has struggled in recent years due to ferocious competition and a massive graft scandal, prompting authorities to overhaul the decade-old industry regulations. A former telecoms minister in Singh’s government and a lawmaker of the ruling coalition are among the 14 individuals and three companies charged in a case involving alleged rigging in the grant of licenses in 2007-08. A state auditor has estimated a potential revenue loss of up to $39 billion to the government due to sale of licenses at below-market prices in that period. Telecoms firms are now bracing for a steep increase in prices of second-generation spectrum and other possible rule changes that may increase their costs of operations. The heads of leading telecoms firms including Bharti Airtel, Reliance Communications and Vodafone, last week met Singh and some other key ministers over the regulatory concerns. In the new telecoms policy, which is expected to be finalized by early next year, the government seeks to relax rules for mergers and acquisitions in the telecoms sector to facilitate consolidation in the crowded 15-player market. India opened the sector for private participation in the mid-1990s. Lower call tariffs and aggressive network expansion by companies to smaller towns and rural areas has seen the sector adding mobile phone users at a fast pace to 870 million currently, from about 5 million in 2002. 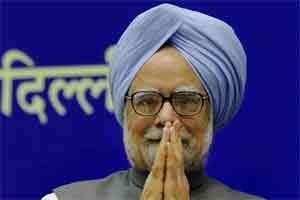 “The telecommunications sector is one of India’s success stories," Singh said. “I would like to take this opportunity to assure all of you that our government will continue to formulate forward-looking policies that will encourage further growth of the telecom sector."